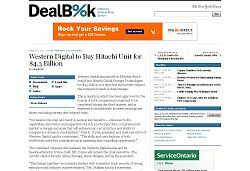 Western Digital announced earlier today that it will be purchasing Hitachi Global Storage Technologies in a deal worth $4.3 Billion. The landscape of storage manufacturers just got a bit smaller, but it remains a massive growing technology industry. These days, much of our important data is being stored on smaller technology platforms and this is increasing the risk of data loss. When an incident occurs the errors, and thus difficulty in retrieving data, are magnified because of the architecture and small scale. When problems happen with data, getting advice from a specialist who understands the inner workings of the technology can be the difference between data saved and data lost. HD videos, 12 megapixel cameras, digital music collections, oh my. The average home user now has more personal data than ever. Here’s a rundown of what solutions for large and reliable storage are available. Increased capacities have allowed users to accumulate and store all of their data, and removed mobile limitations, but it has also made recovery jobs a little tougher. This year’s Consumer Electronics Show was memorable for 3D television, e-book readers, and other gadgets. The one thing that stood out for us here at CBL was the debut of several new USB 3.0 devices.